I did this little sketch in ink last night and also another zentangle. Started out just stacking shapes and just evolved. I have offered to make my best friend's daughter's first communion cake and sounds like it may have to have a second tier to be enough. Learning to make my own fondant, hopefully I can do that by then. I did make a three tier cake for my nieces wedding and put real white roses on it.....my biggest...and most nervewracking ever! Wow you bake and decorate cakes too. Be sure to take pictures of the communion cake. Details we want details. It looks superb. I'd not be able to make that if my life depended on it! Thank goodness it doesn't. Is the convulvulus at the top one of your paintings? It is beautiful. I don't think I've spelt it correctly. I came to you via Marianne's blog then someone else's!! It's lovely. Wow this is good. and you bake these cakes too. Yes we want pix when you do it. Neat sketch. Baking cakes is just another outlet for your creativity! yes, be sure to post a photo. another talent, wow baking and decorating, now that's a time consuming hobby if ever there was one. and so creative. bet apollo licks the dishes when you're done (or wishes he could). Kudos!! I can't cook worth a lick! If it doesn't come from a bag or a box we'd starve. I always thought cake and cookie DECORATING would be fun, as long as someone else did the baking! 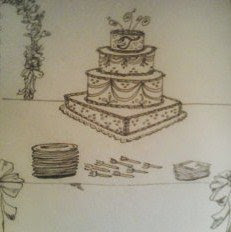 Nice cake sketch. Is that how you plan your real cakes, by drawing them first? wait- you draw, take funny pictures of your pet and write stories, BAKE- CAKES- FOR- WEDDINGS, AND you PAINT!!!??? what a cute sketch! how talented you are to take on cake baking and decorating! i would be so intimidated by that! You have so many gifts. And what a great painting in your previous post, too. i cannot wait to see this cake. the picture is fantastic.